So you know how it goes…it’s the weekend, it’s been a busy week and all you want to do is kick back, watch a movie, go out for a few drinks and food or hang out with friends. While those weekends are ever so fun they don’t get too much accomplished around the house. This weekend I felt like we were really productive and got a number of things from the to-do list accomplished (and still managed to have a few beers at a friend’s party!). Though the vines looked nice and grown-in and green on the fence the whole thing just isn’t part of our long-term landscaping plan. Plus part of the bushy greenery consisted of poison ivy! So the decision was made to get rid of the rusty chicken-wire fence. 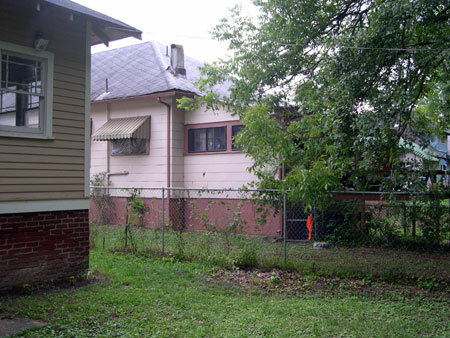 The view after the fence has been removed. Or at least the majority of it – we left a small part that was covered with the poison ivy which we have to kill before removing. Patrick proudly displaying the “lovely” removed chicken wire fence. The front of our house has been looking a bit bland. We love our hedge that separates the street/sidewalk from our lot because it’s makes a natural fence, but the sight right by the house has just been lacking. Not to mention it has the remains of a holly bush trunk that must be as old as the house! I can’t stand that big ugly thing, not to mention I’m not a big fan of scratchy bushes either. 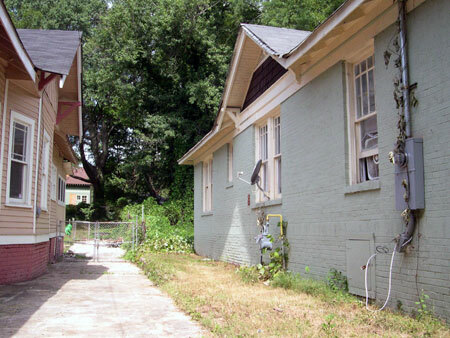 So this picture shows the left side of the house and what we started with. This picture is what we ended up with some 24 hours later. So much nicer! It already helps the ambiance of the front of the house. Awwwww, how nice. 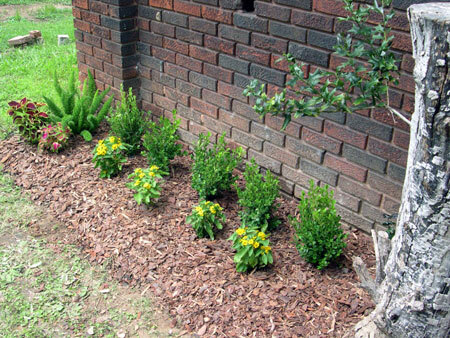 I know this is probably nothing for the average gardener, but like I keep pointing out – we’re newbie’s! So we’re kind of proud of our first nice looking flower bed. I think our previous problem has been that we would go to the store, fall in love with what ever plant and then get home not being sure where to plant it. A week would pass and we would start stressing out about needing to put the plant in the ground. That’s when plants have ended up in places that may not be the most ideal for them or where I later decide that the location would be more optimal for something else in the future. 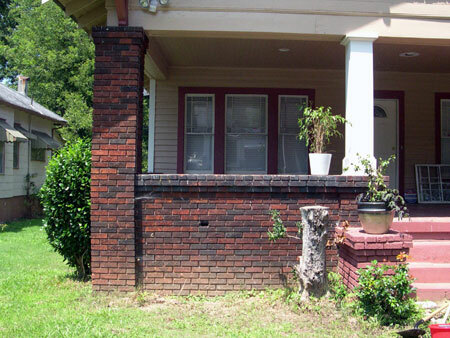 With this project I have really wanted a hedge by the front of the house. So we got these Japanese Boxwoods to make up the background and then some little cute annuals to add color in the foreground. Additionally we came across this neat looking “Asparagus Fern” that adds a little bit of variety (though it may not survive the winter). Additionally we accomplished some interior work…the kind that’s not so exciting though (which is probably why we’ve been procrastinating! ): hanging up blinds. We now have blinds over the six windows in the office. Which also means the boxes aren’t lying on the floor anymore and we don’t have to climb over them to reach the phone. We scraped paint off some of those office windows – too bad a ton of paint is also still on the outside part of the windows. I want to say there may have been a few more things we checked off the list, but I can’t remember them now. Oh well. 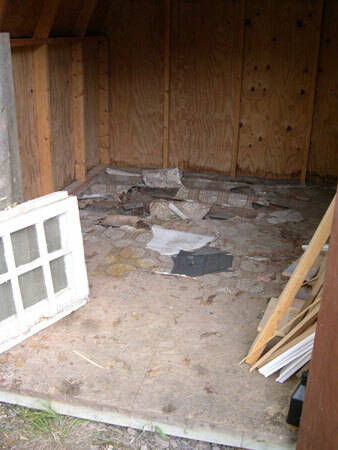 Since we bought the house the back floor in the shed has had a rotten floor and has limited our storage space. So we cleared out the shed (which was too full to even set foot in) and fixed the back area. 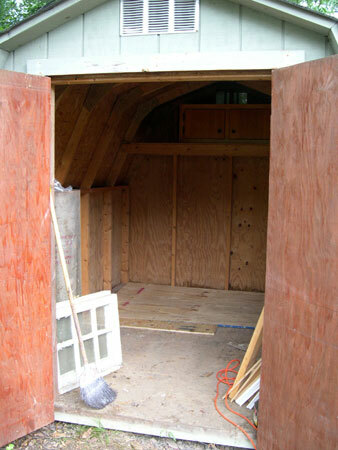 We tore out the old rotten wood, built new framing out of 2×4’s and put down new plywood. So now we were able to organize the shed and are able to actually walk inside of it again. Watching the neighbor’s kudzu has almost become a game for us…”where will it go next?” It had already climbed up the electricity meter to the fascia board and had engulfed the non-existing gas meter. 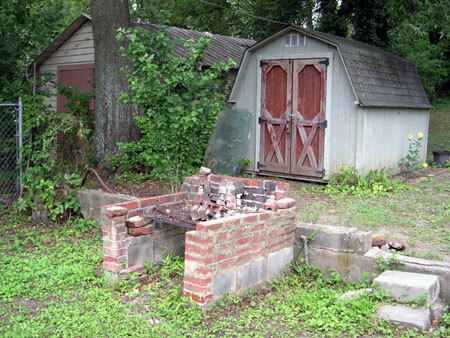 Or at least until recently when the gas company came out and actually hooked up the neighbor’s gas (and in the process removed some of said kudzu around the gas meter). The most recent excitement was that one plant was heading towards the window fan. I think it actually started to wrap itself around some of the fan! So ironically we decided to go to Lowe’s recently to buy some Round-Up kudzu killer. When we left the kudzu was there. 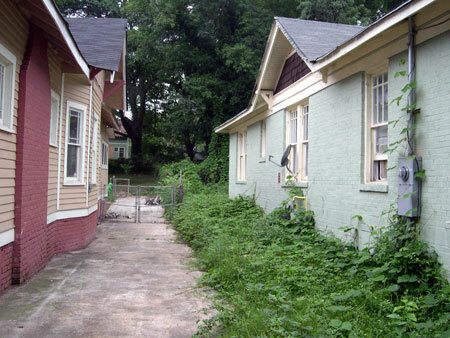 When we came back with the kudzu killer it was gone! Apparently while we were at the store our neighbor had decided that the kudzu on the side of the house was getting too much (maybe they started noticing the kudzu attaching to the window fan?) and chopped it down a good amount. Of course we were also surprised by the chopped off kudzu that was now covering our driveway. We weren’t sure whether to be ecstatic that the kudzu was gone or upset that our driveway was covered with the remains. So while doing yard work the other day Patrick took the liberty of going over the area with the lawn mower to ensure the kudzu was cut even shorter. 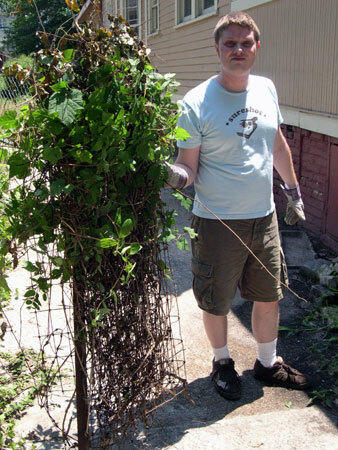 In the meanwhile the backyard is still covered waist high in kudzu and we attempted to spray some of it with the kudzu killer along the property line. Our neighbor has also informed us that they would tackle the back of the yard in the winter/next summer, so we’ll still have to fight it until then. 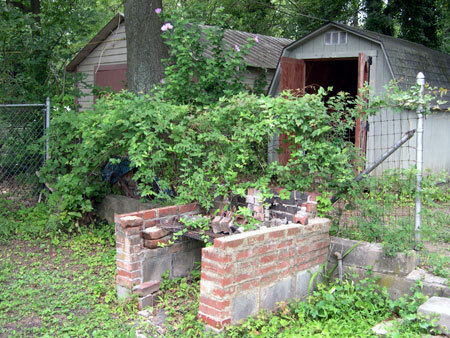 If your guess was “the Perma-John….errrr, I mean Porta-John is missing” then you are a winner! 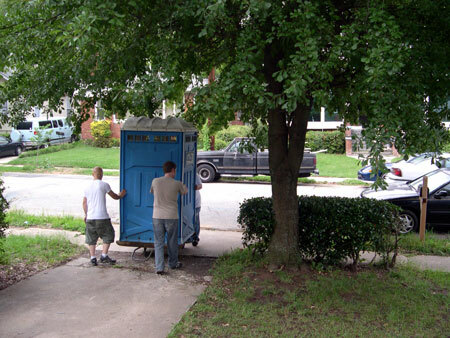 I’m not sure I’ve told the story about this, but when we bought our house it came with a port-a-potty. 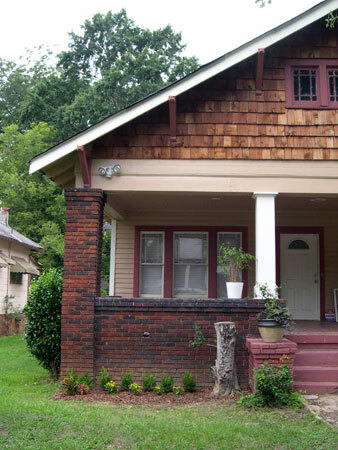 Our running joke has been that it was what sold us on the house. :) Patrick had started researching its removal a while ago. There were two phone numbers and some other names on the port-a-potty through which he had several leads. One phone number led him to call a confused foreigner. Another name to a port-a-potty manufacturer in Dahlonega, Georgia. One of the more obvious names connected it to a large company called Waste Management who initially told us they didn’t have anything to do with the port-a-potty business. Upon a second phone call a lady reluctantly told Patrick that the port-a-potty business had been sold to Blu-John some 2 or more years ago! The Blu-John company indicated that they would pick it up and would contact us after some research. Needless to say we never heard from them again. For a while after this an artist friend was ready to pick it up and haul it off. Either he would haul it to Burningman or give it to another artist friend of his. This dragged on for ages until we gave up. Finally Patrick put an ad on Craigslist a few days ago. We must have had a good 15+ people respond. Some of the reasons ranged from using it for camping and use during a business renovation to using it for the mother’s 50th birthday prank! Patrick then had to send out emails warning that the uhmm….”liquid” would need to be disposed of prior to removal. The list dwindled a bit after that, but finally we found a gentleman that was ready to pick it up right then and there – to convert it into a hunting booth. The Perma-John-less view! We can finally mow the grass (or rather weeds) by that area of the fence now, woohoo. I’m sure we’ll get accustomed to our new view very quickly. …of tomatoes! So this may not be as exciting to some out there as it is to us, but as first time gardeners it’s pretty exciting when you find your very first tomato growing! Not only that, but yesterday we found a second tomato on the same vine. And this morning I was also very excited to find a tiny green bell pepper growing. Woohoo, we’re going to have some of our homegrown veggies before long. 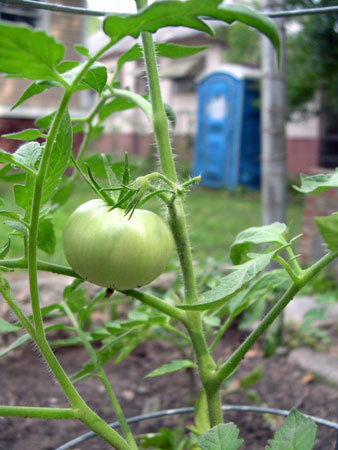 For good measure I took a picture of our first tomato with the port-a-potty in the background. Patrick put it on Craigslist, so hopefully we won’t be owners much longer? A bigger view of our vegetable garden shows that the scrawny little squashes that we planted about a month earlier have nearly taken over the entire vegetable bed! 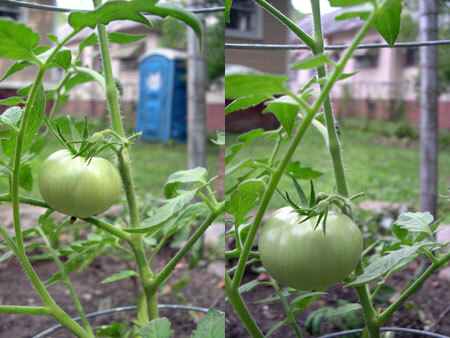 (View photo from a month ago) In the far left we have the “Bigger Boy” tomato that has yet to create any tomatoes. In front of that is the green bell pepper, as mentioned above. Of course it wasn’t until after we planted the bell pepper next to the tomato’s that I read not to plant them next to one another – oops. 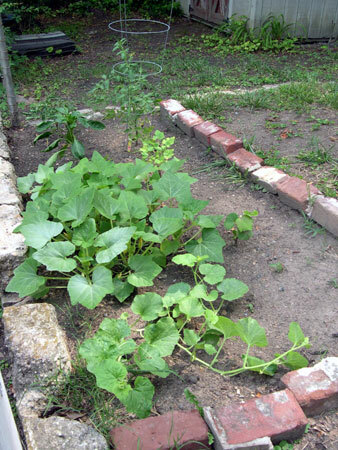 In front of the bell pepper are the six squash plants, and in front of that (closest to the camera) is a honeydew melon. On the far right is our champion tomato that my parents gave us. 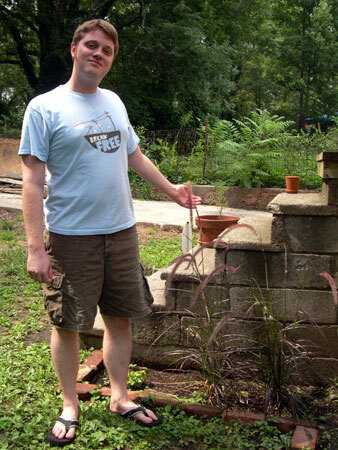 In front of that is a zucchini plant, and in font of that (about to be overtaken by the squash) is our grape vine. 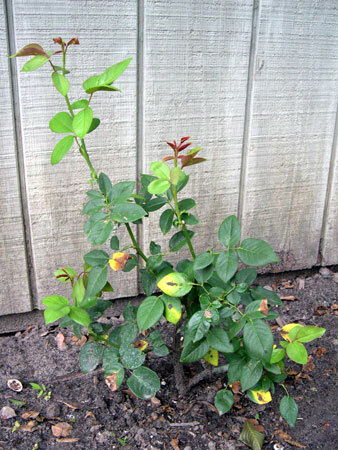 After planting the rose the yellow flowers turned brown and I made my first attempt at pruning. Initially I was scared I had done something wrong – nothing was happening. But about a week ago I started to see tiny growth, and before I could blink the tiny growth had grown some 6 inches on one particular branch! It looks like it’s getting ready to develop a new flower bud, so I’ll be pretty excited if it does. On the morning of Independence Day we decided to plant the bulbs we bought at Sam’s Club. While we were shopping there the other day they sold a variety pack of 250 bulbs for $13! We just couldn’t resist and only thought about the fact that it wasn’t really planting season until we got home. What was even more confusing was that we then also realized that it said these bulbs were for the spring planting season. If anything I would have thought they were going to be for the upcoming fall? 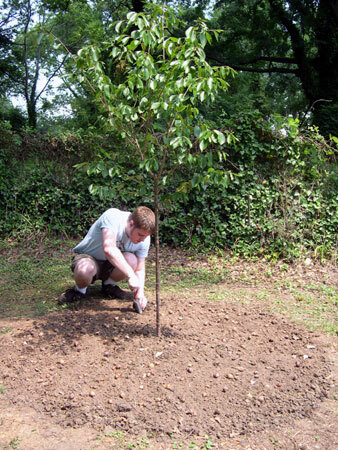 In any case, we decided to plant 110 of them underneath the Yoshino Flowering Cherry tree we had planted this spring. We planted 60 Dutch Iris (“Blue Pearl”) that are supposed to bloom between May and June, and 50 Acidanthera that are supposed to bloom between August and September. Now the question will be if they will ever bloom at all since we planted them smack in the middle of the hot summer. We still have 4 different bulb varieties left to plant in the next few days. The sunflowers seem to be doing ok. I had planted them in three different sections and only a few were dug up by squirrels. The southern most plants seem to be doing the best. I think the rain really took a beating on them, so the majority of them are kind of mushed against the ground, but the one batch seems to be holding strong even after the rain. 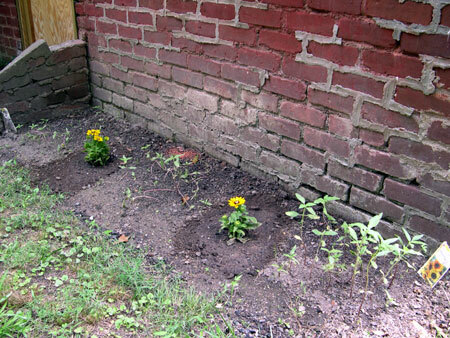 We also planted some cute annuals in between the sunflowers to add some color until the sunflowers will bloom. “All exterior wood surfaces other than cedar, cypress or redwood shall be protected from the elements and decay by paint or other protective coating or treatment; and exterior metal surfaces shall be protected from corrosion by paint or other protective covering.” – I guess you’re limited on the “au naturelle” look, huh? “A functioning flush water closet properly connected to an approved water supply and sewage system shall be provided in a room separate from other living areas; with an approved interior door and latch to afford privacy to the occupant.” – Shhhh, don’t tell anyone our guests have had to go to the bathroom without a latching door!